هجینی نژاد, مرضیه, هادوی, مریم, اسماعیل زاده, شایسته. (1396). بررسی اپیدمیولوژیک آسیب‌های تروماتیک مغز و پیامدهای آن در شهرستان رفسنجان یک مطالعه توصیفی. سلامت جامعه, 9(3), 37-46. مرضیه هجینی نژاد; مریم هادوی; شایسته اسماعیل زاده. "بررسی اپیدمیولوژیک آسیب‌های تروماتیک مغز و پیامدهای آن در شهرستان رفسنجان یک مطالعه توصیفی". سلامت جامعه, 9, 3, 1396, 37-46. هجینی نژاد, مرضیه, هادوی, مریم, اسماعیل زاده, شایسته. (1396). 'بررسی اپیدمیولوژیک آسیب‌های تروماتیک مغز و پیامدهای آن در شهرستان رفسنجان یک مطالعه توصیفی', سلامت جامعه, 9(3), pp. 37-46. هجینی نژاد, مرضیه, هادوی, مریم, اسماعیل زاده, شایسته. بررسی اپیدمیولوژیک آسیب‌های تروماتیک مغز و پیامدهای آن در شهرستان رفسنجان یک مطالعه توصیفی. سلامت جامعه, 1396; 9(3): 37-46. مقدمه: تروما یکی از مهم­ترین مسائل بهداشتی جوامع بشری اعم از جوامع صنعتی و پیشرفته یا در حال توسعه است که روزانه جان ده­ها هزار نفر را در جهان به خطر می­اندازد. برخورد صحیح و مدیریت مناسب تروما، در کاهش میزان مرگ­و­میر و عوارض ناشی از آن تأثیر خواهد داشت. مطالعه­ حاضر، با هدف بررسی اپیدمیولوژیک ضربات مغزی تروماتیک و عوامل مؤثر بر پیامدهای آن در شهرستان رفسنجان طراحی شد. مواد و روش ­ها: این مطالعه از نوع توصیفی است و اطلاعات مورد نیاز به روش سرشماری از پرونده­ بیمارانی که در سال 1391 با تشخیص ترومای مغزی در بخش اورژانس بستری شده بودند، استخراج گردید. ابزار جمع­آوری اطلاعات، پرسشنامه پژوهشگر ساخته شامل: 6 سؤال دموگرافیک و 14 سؤال برای تعیین اپیدمیولوژی و پیامدهای ضربات تروماتیک مغزی بود. اطلاعات با استفاده از آزمون­های توصیفی و تحلیلی (فیشر- کای­دو- t مستقل) تجزیه و تحلیل شدند. یافته­ ها: در طی سال 1391 تعداد 318 نفر با تشخیص ضربه به سر به بخش اورژانس مراجعه کرده بودند که 82% را مردان شامل می­شدند. 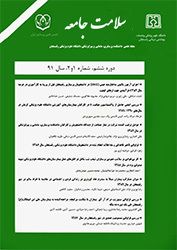 میانگین و انحراف معیار سنی بیماران 69/17±28/28 سال بود. تصادف سرنشین یا عابر پیاده با وسایل نقلیه سبک با 1/69% موارد، بیشترین علت ایجاد آسیب­های تروماتیک مغز را به خود اختصاص می­داد. در 7/83% موارد، آسیب مغزی خفیف گزارش شده بود. 2/79% از بیماران به بخش­های مغز و اعصاب و جراحی و 1/9% به ICU منتقل شدند. 6/6% بیماران مستقیم به اتاق عمل رفتند. یک مورد (4/0%) از آسیب­های تروماتیک مغزی منتقل شده به بخش اورژانس، منجر به فوت شد. نتیجه­ گیری: در مطالعه حاضر، تصادف سرنشین یا عابر پیاده با وسایل نقلیه سبک، مهم­ترین علت بروز آسیب­های تروماتیک مغزی بود و تصادفات جاده­ای در این بین سهم بیشتری داشتند. بهبود وضعیت جاده­ها، ارتقای فرهنگ رانندگی، افزایش کیفیت و سرعت خدمات­رسانی در مراحل پیش بیمارستانی و بخش اورژانس بایستی از اولویت­های برنامه­ریزی کلان باشد. 2Academic Member, Dept. of Anesthesiology, Rafsanjan University of Medical Sciences, Rafsanjan, Iran. Introduction: Trauma is considered to be among the most important health problems of the industrial and developing countries and has a high mortality rate. Proper management of trauma injuries could decrease the side effects and the mortality rate. The current study aimed to evaluate the epidemiology of head injury traumas and its effective factors in Rafsanjan city. Material and Methods: This cross sectional study was conducted using the patients' files in 2012. The data gathering included researcher made questionnaire including 6 demographic questions and 14 questions relating to the head injury traumas. The data were analyzed using fisher, chi square and t- test. Results: The results indicated that in 2012, 318 patients had referred to the emergency room with head injuries of which 82% of were males. The mean and deviation of the age range was 28.28+17.69. Accidents with motor vehicles with pedestrians with 69.1% was the leading cause of head traumas. In 83.7% of the cases the head injury was slight and insignificant. 79.2% of the patients had been transferred to the surgery and neurology wards. 9.1% had been transferred to the ICU and 6.6% had been directly taken to the operation room. Conclusion: In this study pedestrian accidents with light motor vehicles such as motorcycles were the top factor in the head trauma injuries. The improvements of roads, educational programs for the drivers and increasing the quality and speed of emergency services should become the top priorities in order to decrease the traumas. Coats T, Kirk C, Dawson M. Outcome after severe head injury treated by an integrated trauma system. Journal of accident & emergency medicine 1999;16(3):182-5. Andelic N, Hammergren N, Bautz Holter E, Sveen U, Brunborg C, Røe C. Functional outcome and health-related quality of life 10 years after moderate to severe traumatic brain injury. Acta Neurologica Scandinavica 2009;120(1):16-23. Menon D, Schwab K, Wright D, Maas A. Demographics and Clinical Assessment Working Group of the International and Interagency Initiative toward Common Data Elements for Research on Traumatic Brain Injury and Psychological Health. Position statement: definition of traumatic brain injury. Arch Phys Med Rehabil 2010;91(11):1637-40. Calil AM, Sallum EA, de Alencar Domingues C, de Souza Nogueira L. Mapeamento das lesões em vítimas de acidentes de trânsito: revisão sistemática da literatura. Revista Latino-Americana de Enfermagem 2009;17(1):120-5. Puvanachandra P, Hyder AA. The burden of traumatic brain injury in Asia: a call for research. Pak J Neurol Sci 2009;4(1):27-32. Hyder AA, Wunderlich CA, Puvanachandra P, Gururaj G, Kobusingye OC. The impact of traumatic brain injuries: a global perspective. NeuroRehabilitation-An Interdisciplinary Journal 2007;22(5):341-54. Akbari M, Naghavi M, Soori H. Epidemiology of deaths from injuries in the Islamic Republic of Iran 2006;12(3-4):382-90. Siasios J, Foutzitzi S, Deftereos S, Karanikas M, Birbilis T. The traumatic brain injury: diagnosis and management at emergency department by general surgeon. A retrospective critical analysis on the use of the CT head scan. Turkish neurosurgery 2010;21(4):613-7. Francis CM, Desouza MC. Hospital Administration. 3nd ed. New Delhi. Japee Brothers Medical publisher; 2000:178. Karbakhsh M, Zandi N, Rouzrokh M, Zarei M-R. Injury epidemiology in Kermanshah: the National Trauma Project in Islamic Republic of Iran 2009 East Mediterr Health J 2009; 15(1): 57-64. Beckstrand RL, Smith MD, Heaston S, Bond AE. Emergency nurses’ perceptions of size, frequency, and magnitude of obstacles and supportive behaviors in end-of-life care. Journal of Emergency Nursing 2008;34(4):290-300. Berg J, Tagliaferri F, Servadei F. Cost of trauma in Europe. European Journal of Neurology 2005;12(s1):85-90. Myburgh JA, Cooper DJ, Finfer SR, Venkatesh B, Jones D, Higgins A, et al. Epidemiology and 12-month outcomes from traumatic brain injury in Australia and New Zealand. Journal of Trauma and Acute Care Surgery 2008;64(4):854-62. Fu TS, Jing R, McFaull SR, Cusimano MD. Recent trends in hospitalization and in-hospital mortality associated with traumatic brain injury in Canada: A nationwide, population-based study. Journal of Trauma and Acute Care Surgery 2015;79(3):449-55. Taussky P, Widmer HR, Takala J, Fandino J. Outcome after acute traumatic subdural and epidural haematoma in Switzerland: a single-centre experience. Swiss medical weekly 2008;138(19-20):281-5. Settervall CHC, Sousa RMCd, Silva SCF. In-hospital mortality and the Glasgow Coma Scale in the first 72 hours after traumatic brain injury. Revista latino-americana de enfermagem 2011;19(6):1337-43. Feizi A, Jarineshin H, Estabragnia H, Mahoori A, Khalkhali H, Sattari S. Study of Correlation of Glasgow Coma Score and Bispectral Index in Mild and Moderate Traumatic Brain Injuries. Journal of Urmia Nursing & Midwifery Faculty 2011;9(5):1-6. Almeida RLFd, Bezerra Filho JG, Braga JU, Magalhaes FB, Macedo MCM, Silva KA. Man, road and vehicle: risk factors associated with the severity of traffic accidents. Revista de saude publica 2013;47(4):718-31. Dirlik M, Bostancıoğlu BÇ, Elbek T, Korkmaz B, Çallak Kallem F, Gün B. Features of the traffic accidents happened in the province of Aydın between 2005 and 2011. Ulus Travma Acil Cerrahi Derg 2014;20(5):353-8. Peden M. World report on road traffic injury prevention. Geneva, World Health Organization; 2004. Mashreky SR, Rahman A, Khan T, Faruque M, Svanström L, Rahman F. Hospital burden of road traffic injury: major concern in primary and secondary level hospitals in Bangladesh. Public health 2010;124(4):185-9. Obby R. Pre-hospital trauma care: Training and preparedness of and practice by medical general practitioners in Limpopo province. Thesis for master of family medicine. University of the Witwatersrand, Johannesburg. 2009.